The Surface Pro 4 is the best Surface Pro yet, but it still makes small concessions as a laptop and tablet. Pro (+) Super sharp screen; extremely portable; fast and quiet; very adjustable hinge. Noob (+) Keyboard sold separately; only one USB port; makes concessions as a laptop and tablet. When the original Surface Pro came out in 2012, it was seen as the awkward redheaded stepchild in both the tablet and laptop scenes. Through multiple iterations and levels of refinement, the two-in-one convertible has begun to blossom into its own. It’s now seen as edgy and practical. It's Microsoft’s Ugly Duckling story, if you will. As with the Surface Pro 3, Microsoft maintains its unique 3x2 aspect ratio, but bumps up the resolution to 2736x1824. The 12.3-inch screen looks absolutely crisp. Its size makes it a little awkward to hold as a tablet, but its built-in kickstand allows you to prop it up at just about any angle. All of this is housed in a silver-colored magnesium casing, which feels premium and cool to the touch. The Surface Pro keyboard is sold separately, but you'll definitely need it. One gripe that we had with past Surface models is that Microsoft sells the keyboard separately, and that problem persists. Even with its $130 price tag, we consider the keyboard to be vital to the Surface experience (and have adjusted the overall price at the bottom to reflect as such). Despite the small size, the Surface Pro 4 keyboard is actually very good. There’s pretty much all the same keys you’d find on an Ultrabook, including arrow keys, and the plank has a subtle LED glow to it too. There’s also some decent travel time and satisfying clicky noise. And the magnet that holds it in place is super strong and easy to snap on. It’s so strong that you can even dangle the Surface upside down holding nothing but the keyboard. The trackpad is a bit small, but it does the job for the most part. There was one instance where it wasn’t very responsive, but we suspect it was a software issue and haven’t encountered the situation since. While the keyboard isn’t included, Microsoft does include a stylus that works well and snaps onto the side of the Surface magnetically when not in use. We really liked the speakers as well, which sounded plenty loud and clear. Most of the improvements to the Surface Pro 4 are under the hood. 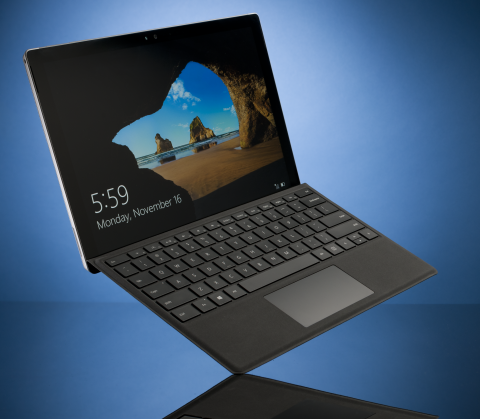 In conjunction with Windows 10 is Intel’s new mobile Skylake CPU. Ours came with an i5-6300U clocked at 2.4GHz, but you can get it in Intel Core m3 and i7 flavors as well. Coupled with the CPU is Intel’s HD 520 graphics. Compared to our new zero-point, Dell’s XPS 13 (reviewed in the August 2015 issue), the Surface Pro 4 really does impress. CPU-side, it was faster than the XPS 13 from 2–29 percent, giving it its biggest thrashing in our multithreaded test. But graphics is where Skylake was really able to beat on its Haswell counterpart with a 29–36 percent lead. In real-world terms, we were able to play CS:GO at 1920x1440 resolution with medium settings and AA turned off at around 50fps. That’s not bad and is certainly playable. You should be able to play a lot of popular non-taxing games on this at either low or medium settings. The Pro 4 was also extremely quiet during our gameplay sessions. In terms of battery life, the Pro 4 lasted 270 minutes in our run-down test. We also saw similar numbers in our real-world experiential test, with the convertible keeling over in 290 minutes. It’s okay, but probably won’t last you all day. The biggest sins of the previous and current Surface models are the compromises it makes as both a laptop and a tablet. There were times where we forgot that it’s not a laptop and tried to pull the monitor towards us only to have it almost flop face first down onto the keyboard. In addition, while you can put it on your lap, it isn’t as comfy or stable as a laptop. Another gripe we had with it is that it only has one USB port; most Ultrabooks offer more. Still, we think the Surface works better as a laptop than a tablet. Typing with Windows 10’s built-in virtual keyboard is ungainly because of the tablet’s big size. The issue is only complicated further because the digital keyboard lacks swipe gestures and predictive text. Still, those issues aside, this is the best Surface Pro yet and it even beats several top-tier Ultrabooks in performance. It’s also super easy to carry around in a backpack. We’re just not sure if there is truly an “all” in one device out there just yet. Our zero-point Ultrabook is a Dell XPS 13 with an Intel Core i5-5200U clocked at 2.2GHz with 8GB DDR3 RAM, running Windows 10 64-bit. 3DMark 11 was run in Performance mode; Tomb Raider was run using low settings.